With our personalized service you minimize time spent on laundry so you can maximize focus on your core business. From our high-quality processing, convenient emergency backup services and competitive pricing—to on-time delivery and personalized handling for busy professionals—Imperial believes that without quality service, nothing else matters. Many of our clients can’t do business without clean laundry, and we take our responsibility very seriously. Start to finish, all of our handling, processing and delivery processes are designed to make you look good and help you to continue normal service to your patients or customers without interruption. Imperial’s pricing is very competitive and most importantly—all inclusive with no additional charges for anything—period. Some commercial laundries base their pricing on the wet soiled weight—which can be as much as 20 percent heavier than the clean dry weight. At Imperial, we base our pricing on the clean dry weight after processing is complete. This way you only pay for processing you receive. Imperial is an environmentally responsible company that safeguards our staff’s occupational health and safety. All laundry processes and staff training programs follow strict “Universal Precautions,” as prescribed by OSHA and the Joint Commission of Accreditation of Healthcare Organizations. At the time of pick up, all soiled items are sealed in leak-proof plastic bags. At our plant, the bags are opened and sorted as required by type, i.e. color, fabric, soil level and soil type. This careful sorting process helps ensure proper cleaning while extending the useful life of customer-owned linens and garments. Lightly soiled items receive processing prescribed for light soil, and likewise, stronger treatment is used for heavily soiled items. We offer stain removal service options, but only after you have agreed to them per item at the time of service. After washing, pressing and folding, clean linens are stacked neatly into transport carts and sealed in plastic. The carts have open sides for easy access and distribution of clean linens. 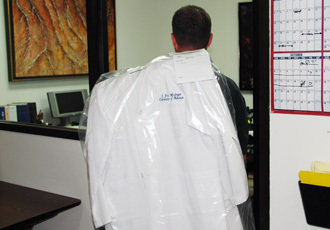 Separate personal items such as lab coats and chef’s uniforms are properly tagged and kept separate throughout processing. All bulk items are processed in separate batches to ensure the soiled linen items we pick up from you are the same items we deliver back to you clean. The integrity of each load is carefully maintained from pickup to delivery. As an option we offer specialized stain removal services for stubborn stains that do not respond to normal washing and stain removal, i.e. waterproof or long-lasting cosmetics which actually have dye in their ingredients. 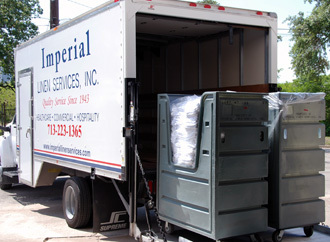 You can expect exceptional pickup and delivery services from Imperial. We cover the entire Greater Houston area with dependable service on schedules geared to our customers’ needs. Our trucks are kept meticulously maintained and are equipped with heavy-duty lift gates to safely accommodate both ground level and raised dock delivery situations. Route service personnel are carefully selected, trained and supervised to uphold Imperial’s high customer service standards. Our drivers are professional, personable, efficient, and cross trained on multiple routes to ensure greater scheduling flexibility and absolute reliability. 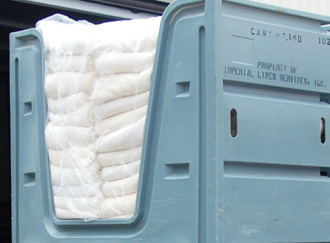 All of our commercial customers depend on a daily supply of clean linens to stay in operation. Imperial is one of only a few commercial laundries still accepting emergency backup projects on short notice. 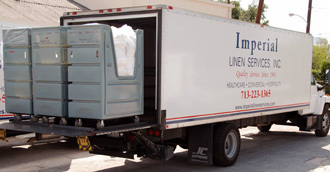 If your normal laundry service or on-premise laundry is backlogged or inoperative due to equipment failure, remodeling, natural disasters or any other reason, give Imperial a call and we will pick up your soiled linens and immediately start processing and delivery. We maintain surplus capacity to accommodate such situations. For top professionals, personal appearance is very important. Imperial offers a special service for physicians, nurses, chefs and other professionals who need impeccably clean and sharply pressed apparel on a daily basis. Our personalized service helps professionals minimize the time spent on laundry so they can maximize the time spent on their core business. Physicians’ lab coats and smocks, chefs’ uniforms and aprons are laundered, starched, pressed, placed on hangers and sheathed in plastic. We even hand deliver and hang them in the office closet. A ready supply of sharply detailed clothing is a tremendous advantage for busy professionals, especially those in fast-paced healthcare and food service industries. Allow us to help you organize your linen storage to help you have what you need, when you need it, easily accessible to you and your staff. You deserve your professional apparel ready to wear with no worries about who remembered the office laundry washed at home or to pick up the dry cleaning. ©2015 Imperial Linen Services, Inc. All rights reserved.